Now he just came on for the main noon segment, and his voice is much worse. He can hardly talk. I’m really surprised he didn’t have a sub today, maybe it came on too fast to get one. Better give Fred Thompson a call for tomorrow! Remember a while ago when Paul was off for quite a while because of his voice? I thought he was done then. I was surprised when he came back, and impressed with how strong his voice was. At 88 years old, his voice continues to be very strong. But I’d guess his voice is also pretty susceptible to strain and sickness, which is why it can plummet so quickly. 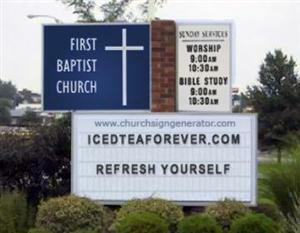 I’ve always appreciated the Baptists. My wife really wanted a birdfeeder for Christmas, so I got her one. We’ve been enjoying watching all the birds in our backyard. We’ve seen a lot of different kinds. Apparently though, we’ve attracted some of the neighborhood psycho birds. There is this one red cardinal (fittingly the Hoosierville state bird) that hammers our windows. Over and over. For weeks this mentally challenged bird has consistently been nailing a very small ground-level basement window. For long periods of time. Once in a while just for variety, he’ll tap a bedroom window, or sometimes the front screen door. My wife said that he was banging on a window once so she scared him off. Then she claimed he followed her around the house watching her through windows. He’s psycho, I tell you. The past few days he’s starting to frequent the basement egress window right around the corner from my desk! I’m about ready to grab a 12 gauge and put an end to this, but I guess that would probably be illegal. I wonder of there’s a mental impairment clause to shooting state birds. May 27 is the due date. My wife is getting more uncomfortable all the time. A week ago Saturday we ended up going in to the hospital hoping it was the real thing, but it wasn’t. Hopefully soon though. So are we going to be forced into getting a minivan?! Not if I can help it. I want a big 4-door car. I have a little 4-door right now, that will probably have to do for awhile. Someday though I want an ’05 Impala. Judging from the amount of them I’ve seen since I started wanting one, I’m about the only person that doesn’t have one yet. The last couple of weeks I’ve been driving tractor for a buddy of mine from church. I’m trying to learn the Hoosierville farming methods. I’ve been plowing, chiseling, and cultivating with a John Deere 4455 and a 7700. It’s kinda weird, they do everything back and forth out here. I was brought up driving around the field, but now I just go back and forth. Remember this classic Hoosierville sign? They just put it back up, evidently duck manure is back in season. Who would have known at the time that we would eventually live 1/10 of a mile away. Our house is right by my head. Did you know that you can do a nondestructive reinstall of Windows XP over top of a problematic install without reformatting? It’s a complete rebuild without losing data or reinstalling software. I’ve done it a couple of times, most recently last weekend. Good guy Fred Langa has saved my bacon twice now. Speaking of Fred, I recently found a great article he wrote on building a network file server. I appreciated it so much because I had already done it and could affirm the wisdom thereof.